Excicata identificada por W. R. Taylor. Foto: Yusimí Alfonso.. Type locality: "Ad insulam S. Crucis" (St Croix, Virgin Islands) (Silva, Basson & Moe 1996: 793). Lectotype: unknown; LD 7287 (Leliaert & Coppejans 2006: 664). Notes: Leliaert & Coppejans (2006: 664) note that St. Croix is indicated as type locality in the original prologue. Several specimens of this species from that locality are present in LD; one of these, labeled 'Conf. 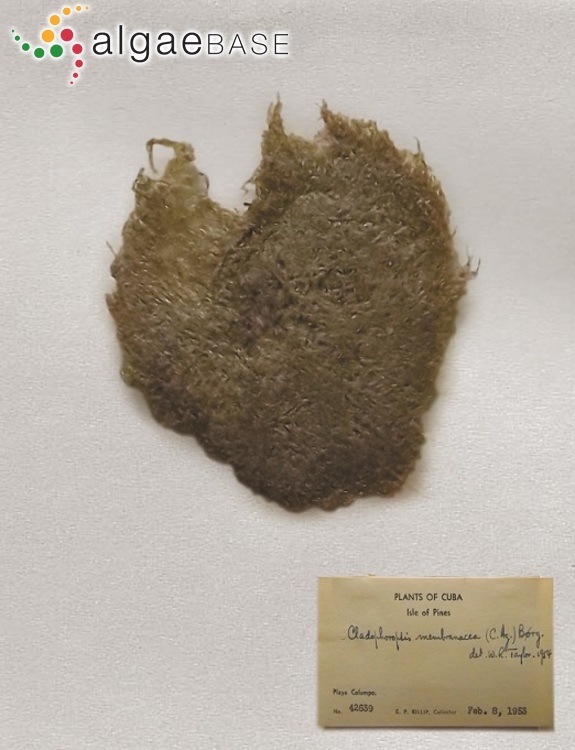 membranacea Hoffm, Ins St. Crucis' from the Agardh herbarium, is indicated as lectotype. Leliaert, F. & Coppejans, E. (2006). A revision of Cladophoropsis Børgesen (Siphonocladales, Chlorophyta). Phycologia 45: 657-679.